For as long as I can remember, Ed’s parents have had cats at their house. Like most farmers, Ed’s daddy kept cats around to help with the problem of mice. My father-in-law always seemed to enjoy having cats around. My mother-in-law–not so much! In her older years, she fussed a lot about the cats getting under her feet, and was always afraid they’d make her fall. Now that I’m growing older, with cats under my feet, I’m beginning to better understand her fears. It’s a funny thing, cats never seem to last long at Ed’s parents house. Their house is close to a busy highway, which has claimed more than its share of victims, but their house is also close to some wooded areas, which serve as homes for wild coyotes and other creatures. Occasionally, a cat will live a long and prosperous life there. “Trouble”, the cat, has been one of those exceptions. I actually adopted “Trouble” from my in-laws, many years ago, and brought her to live at our house. We thought ‘she’ was a ‘he’ when we got her–hence, her name! After living with us for several years, “Trouble” decided to leave home because she didn’t like all the new animals I kept bringing home from the shelter. For a while, she stayed with one neighbor or another, then “Trouble” actually moved back to my in-laws house! “Trouble” used to hitch a ride home with me when I’d visit there, but she would always end up going back to my in-laws house. Our son, Brad, lived with his “Mema” during her final few years of living at home. When Trouble moved in, she joined a couple of feral cats who were already living there. Brad would occasionally let “Trouble” inside of the house to keep him company, and the two became buddies. Time passed. Ed’s mom moved to the assisted living home, and Brad got married and eventually moved away. Brad considered taking “Trouble” with him when he moved, but decided she may not adapt well to the move since she’s so old. Besides, “Trouble” and his new bride weren’t exactly the best of friends ever since “Trouble” went to the bathroom on Jennifer’s pajama bottoms! 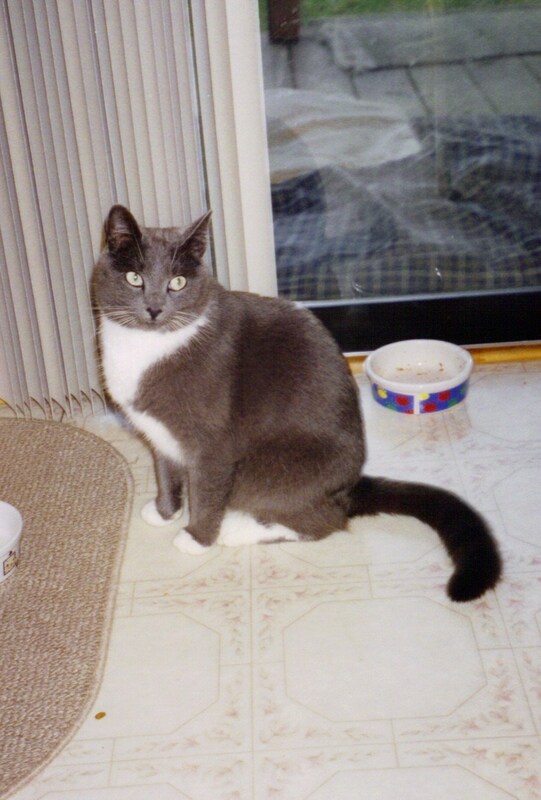 By the time Brad moved, only two cats were left at my MIL’s house–“Trouble” and one feral cat. Everyone said not to feed them, then they would relocate, but I just couldn’t stand to do it. I began putting some dry food in a feeder, every other day, but soon every wild thing within a mile began coming over to eat out of the feeder–including some skunks! These days, Ed stops by every day, after work, to check the mail and feed the cats, but only as much as they will eat immediately. Sometimes I’ll join him for the feeding trip on the weekends. Recently I was surprised to discover that the feral cat now recognizes Ed’s car, and runs up to meet him when he arrives! She’ll even let him pet her, occasionally. A while back, the feral cat managed to get herself pregnant. Now Ed’s feeding five cats instead of two! We had to start buying canned food, in addition to dry food, so the kittens would be able to eat, too. It never ends. I can’t help but wonder how long it will be before those cats recognize Ed’s car and run out to greet the man with the can, too! I can see the future now. One of these days we’ll put a sign out in front of my MIL’s house. It will read: HOUSE FOR SALE – Includes a passel of free cats…to help control the mice population! Cute story. Buy a house, get a cat – a new marketing tool? Fun story. We don’t own a cat, but there are cats in our yard all the time. Some of them seem to live under our shed. We do not feed them, but obviously someone in the neighborhood does. My sister had feral cats on her property when she moved in. It was not easy to get them relocated and she did feed them for a while, but they spread the word so more came. Aaagh! Now she still has two cats and two dogs, but they redid their backyard and it’s a little oasis so they keep the strays away. Trap, spay, neuter. Our town has a feral cat problem. Several years ago the animal control officer said the feral cats’ babies, at least the ones he could get close to, would have sores and other health problems. How kind you and Ed are. If the cats do start to breed, you might want to look into the animal charities near you and see if any have a trap and spay program where they trap and bring them to a partcicpating vet than release them where they were found. They might takeover the feeding duties too. PS Trouble is a beautiful cat! so you thought it was a male cat – explains the male sounding name. seems like an out of control rodent control system to me but then I don’t live out in the country.